The vegetable garden is always a year-round affair for me. That doesn’t mean I actually harvest and eat things every month, but there is always activity. I started these on January 18. There are Walla Walla onions, two or three varieties of storage onions, two varieties of lettuce, leeks, and shallots. There are also a few spinach plants in here too out of the picture frame. 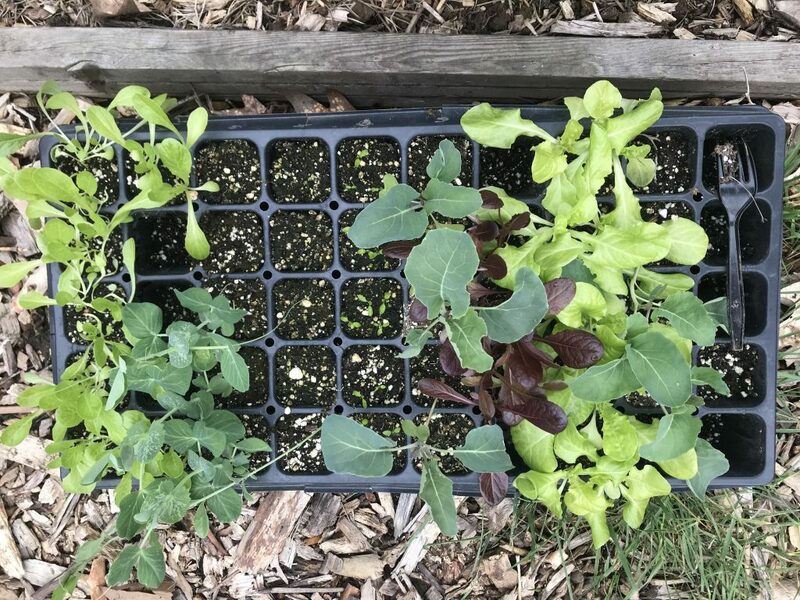 Both lettuce varieties are particularly cold-hardy; later in the spring I’ll transition to different varieties that don’t need to be cold-hardy, and eventually in the summer we’ll get into varieties that are actually bolt-resistant and tolerant of heat. In my 2nd seedling tray I have almost all peppers. 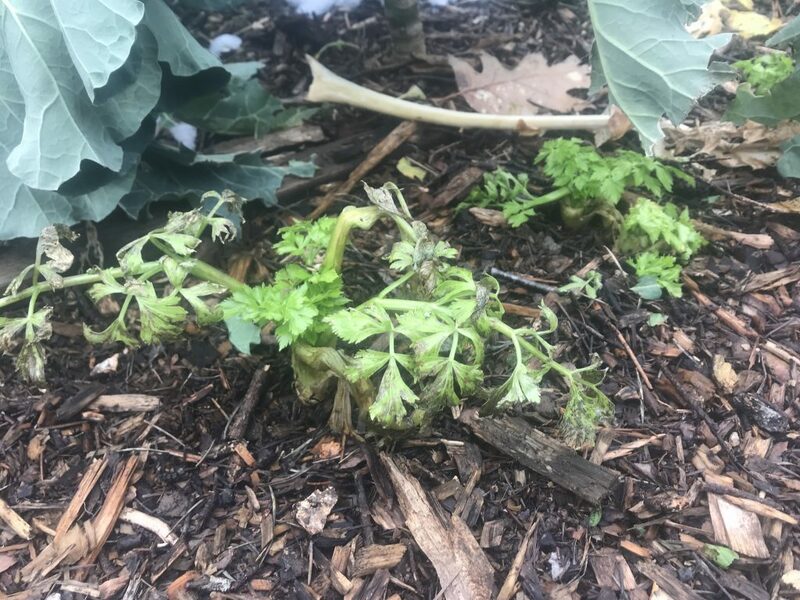 This one row is eggplant, and they’re up first! I sowed these seeds on January 26. 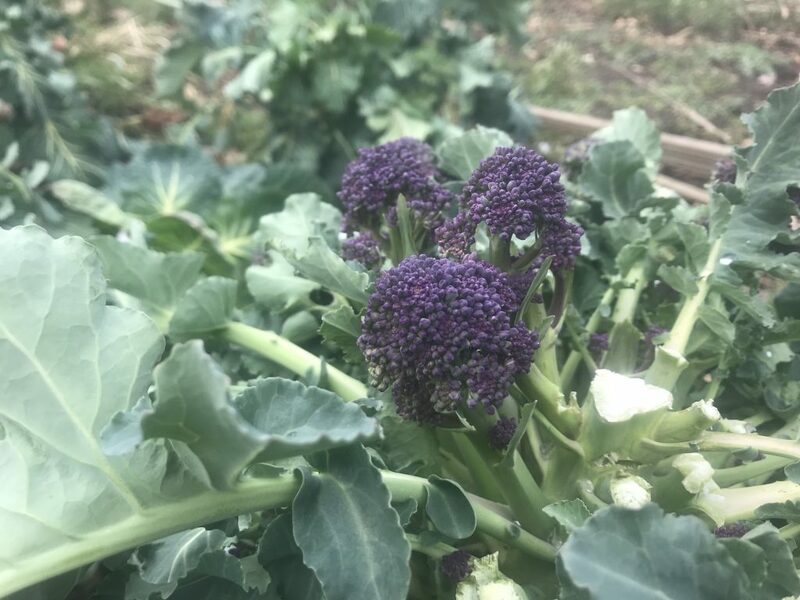 Outside now, in the back yard, we have some broccoli! 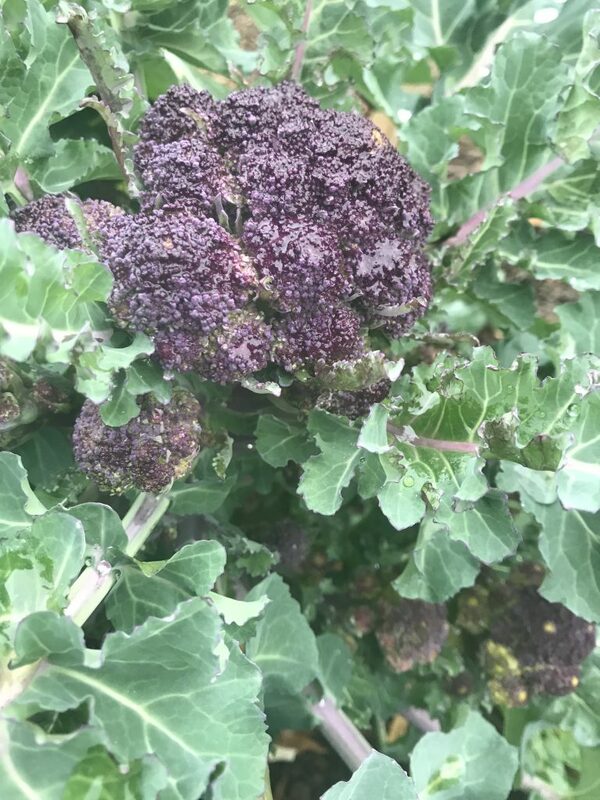 I’m almost positive this is variety ‘Rudolph’ which is a purple sprouting type that doesn’t require vernalization, so it matures earlier, and slightly more uniformly? With more of an actual head? 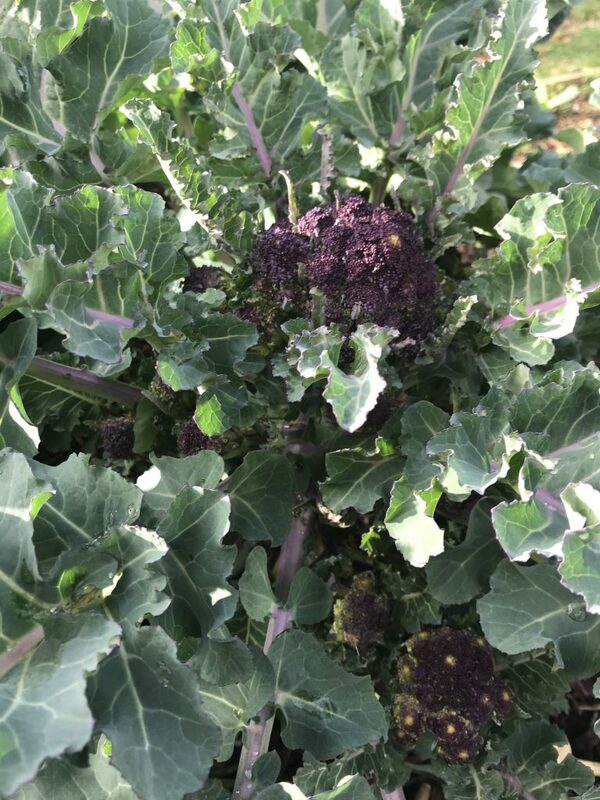 This is how it seems to me anyway, compared to regular purple sprouting broccoli which really doesn’t make a central head at all. 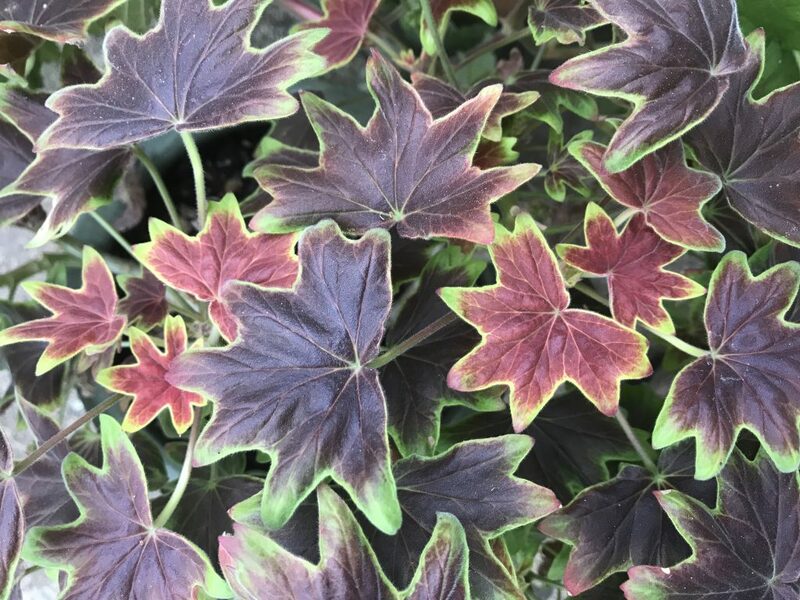 These plants are flipping beautiful, too. 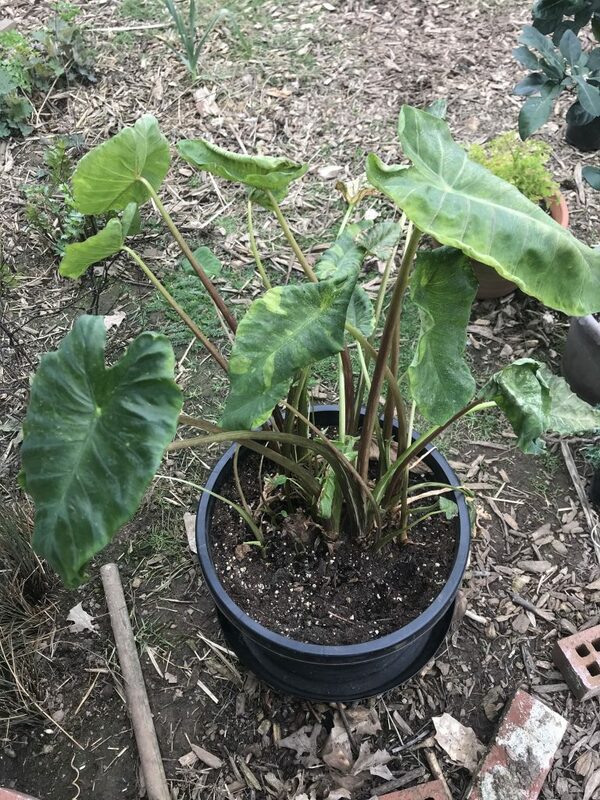 yeah, this is the same plant as the first picture above. I really like this one! I’ve had a much easier time growing Brassicaceae plants this year than ever before. I attribute that to a couple of garden helpers you’ll meet later in this post. 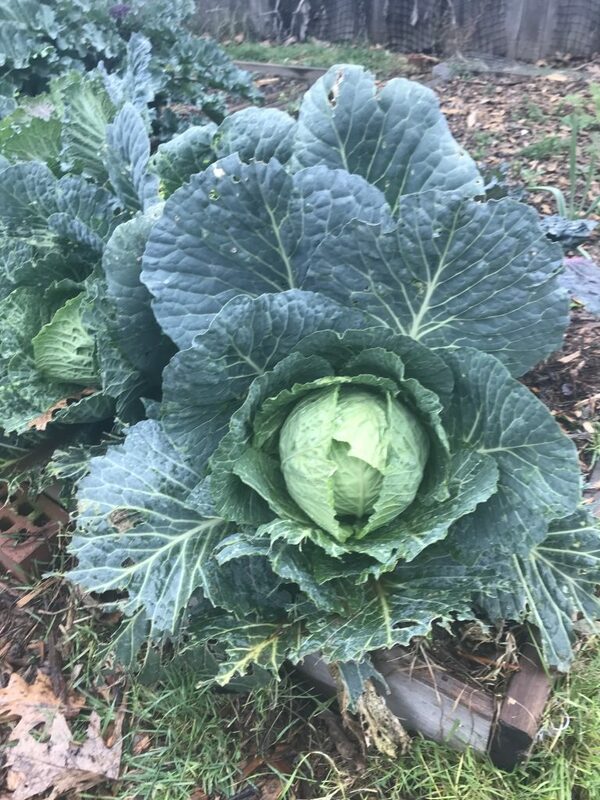 On to cabbage. This one is ready for harvest anytime! 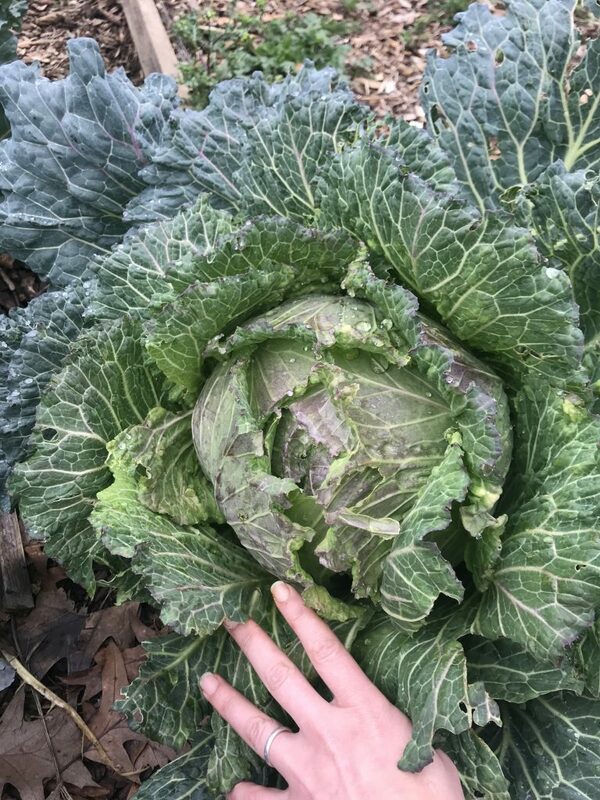 The variety here is ‘January King.’ This is my favorite winter cabbage variety – if I had to grow just one, it’d be this one. I’m not sure, but this may be ‘January King’ as well. But this one doesn’t look like it’s going to head up. I always think that when they’re at this stage, and usually they prove me wrong. We’ll see. 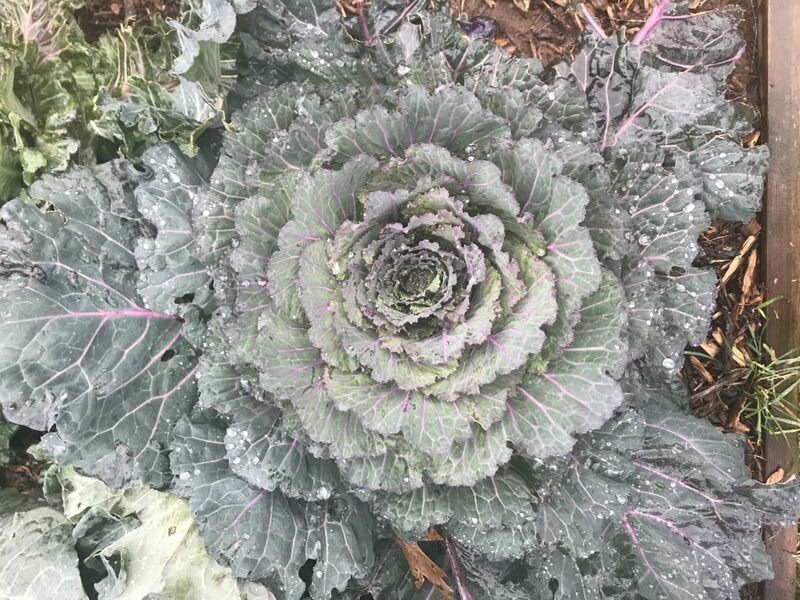 It looks like ornamental kale, kind of, doesn’t it? 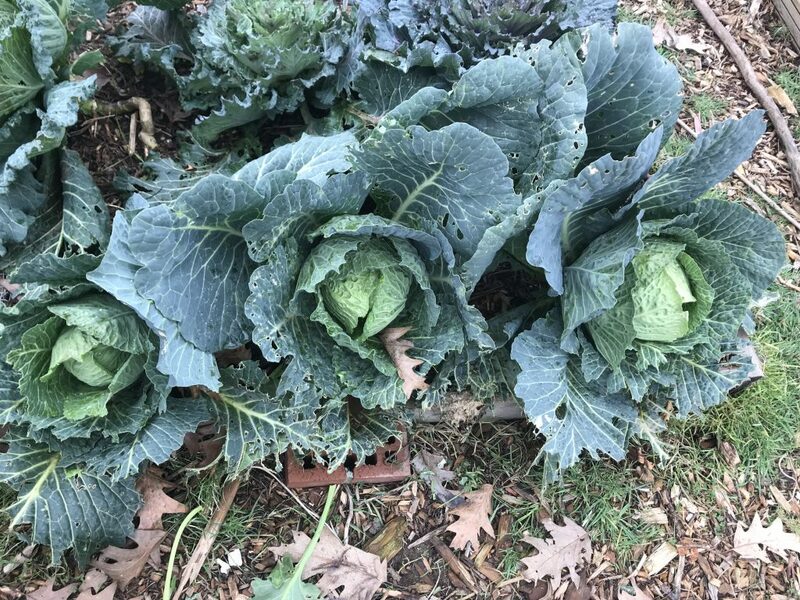 Here are some other cabbages – these came from an overwintering cabbage blend from Territorial. So who knows what the actual varieties are. I don’t really care; they change what’s in their blends every year anyway. See all the evidence of something eating the lower/older leaves on these? 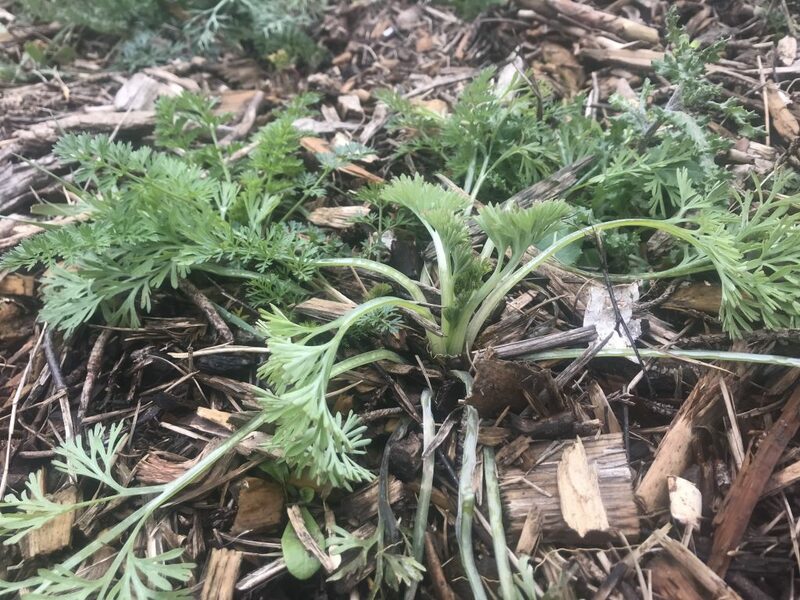 All these Brassicaceae family plants have that to some degree or other. It’s about half slugs and half birds. Earlier in the fall, before the ducks were coming over to this side of the garden, the slugs and probably cutworms were having their way. I’m happy to report that I have done absolutely nothing I mean NOTHING to combat slugs and cutworms this year. The ducks eat them all! This next one is a crappy picture, sorry! But this shows the cabbage on the far right in the above photo. You can see that it’s heading up very nicely and should be ready later this month. 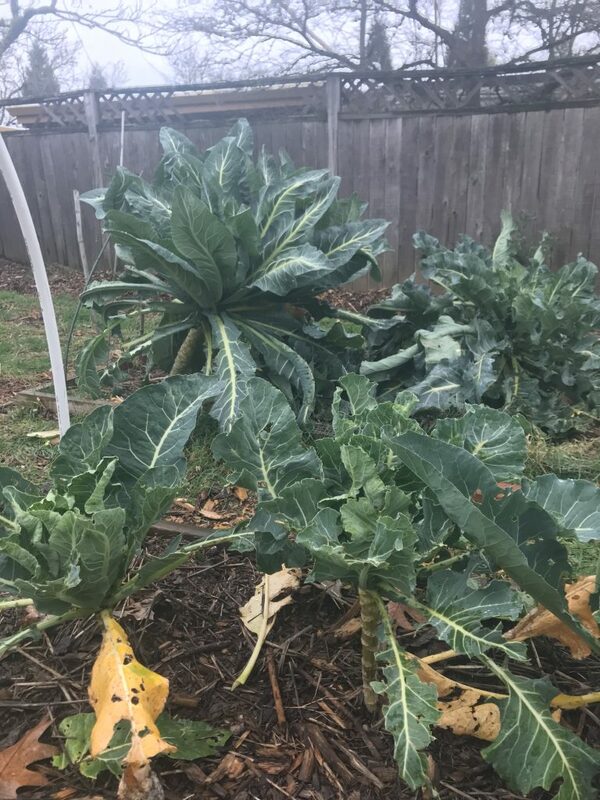 I just harvested three plants’ worth of Brussels sprouts. I thought this one could go a bit longer so I left it. Again this is from one of those winter season mixes from Territorial. 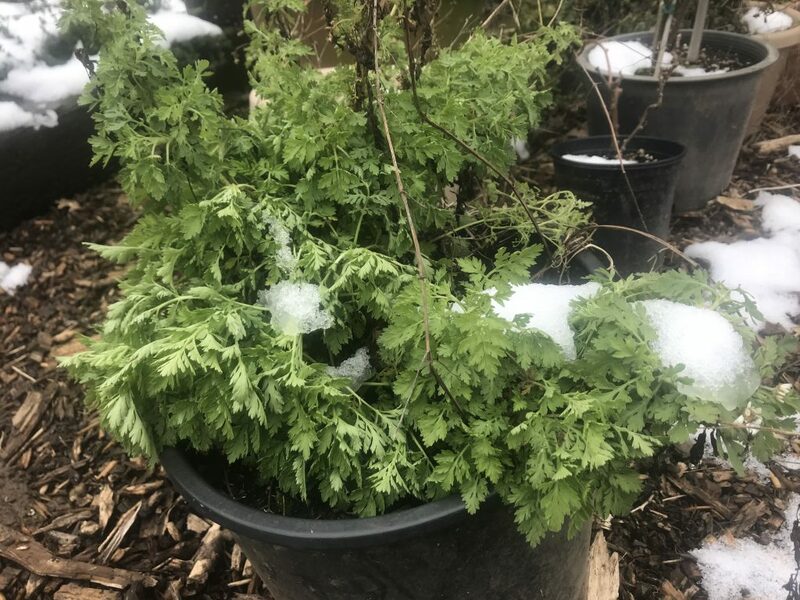 Nordic Winter Blend Hybrid, it says. Three different varieties apparently. So maybe those others were earlier-maturing. 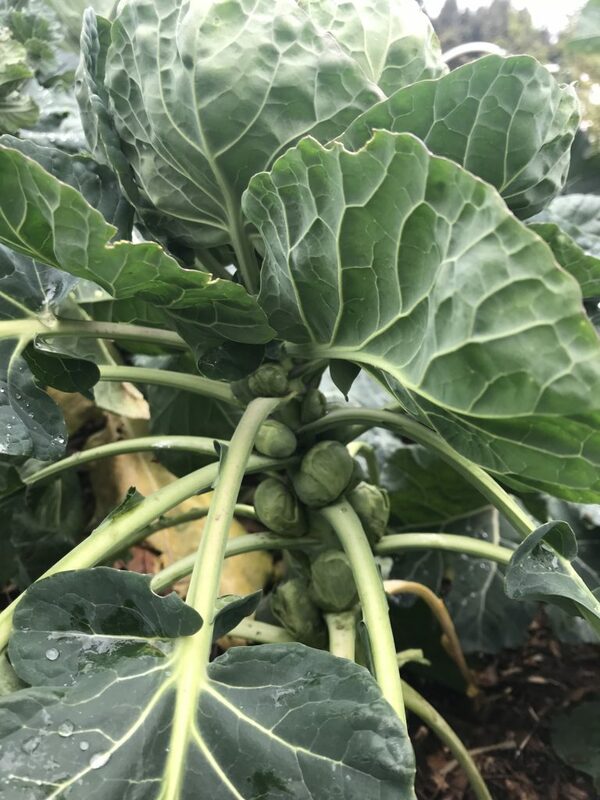 I have to put a plug here for growing these Brussels sprouts over the winter. You might find yourself hosing off aphids a couple times in September, but then once the cool weather hits, the aphids split town and you’re golden. It’s a million times easier to grow all these Brassicas in the cool season, I find. If you haven’t done it, I encourage you to try next year. 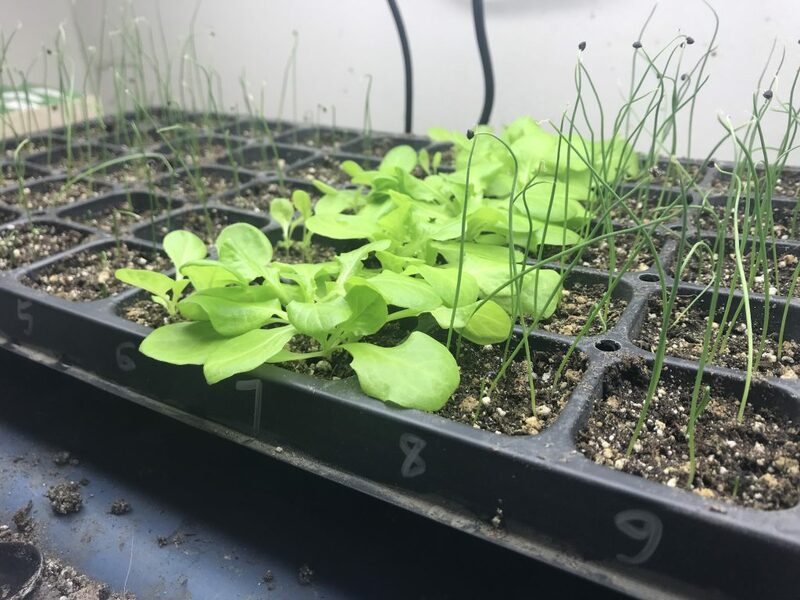 Get varieties bred for the cool season, or for overwintering, sow your seed indoors in mid-June, and set plants out in August. 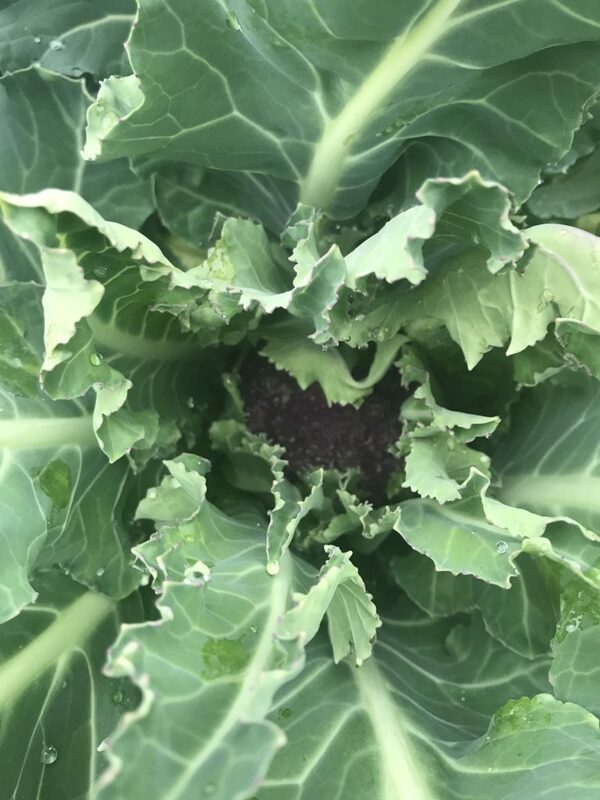 Watch ’em for aphids and spray with Bt for those cabbage moths. You’ll only have to do that until the cool weather of fall comes. They don’t need any protection from freezes, I promise. Here’s my helper Ramona, digging slugs and worms out from under the 2″ layer of wood chip mulch in there. These plants are tall enough that she can easily walk under and among them and keep everything tidy. Sure, she nibbles a leaf now and then, but mostly the ducks are after insects. I feed them grain every day, too. 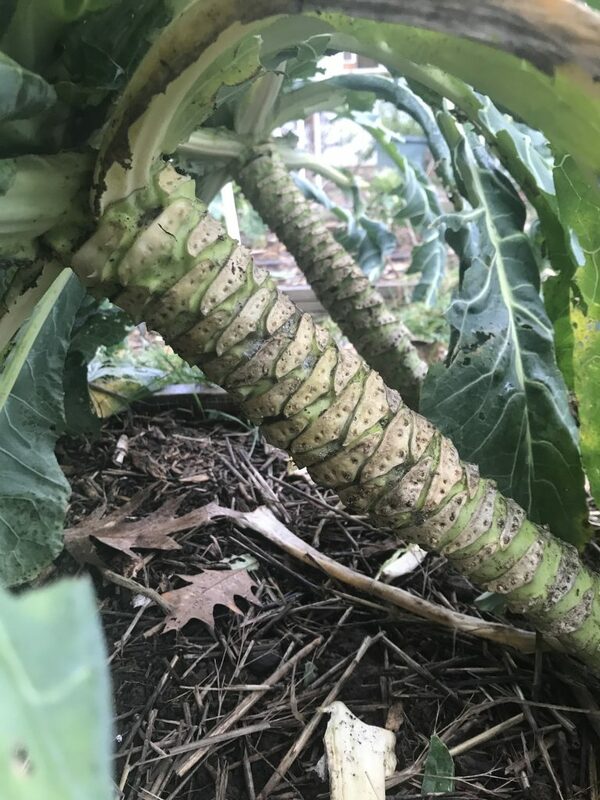 These next plants are the cauliflower. 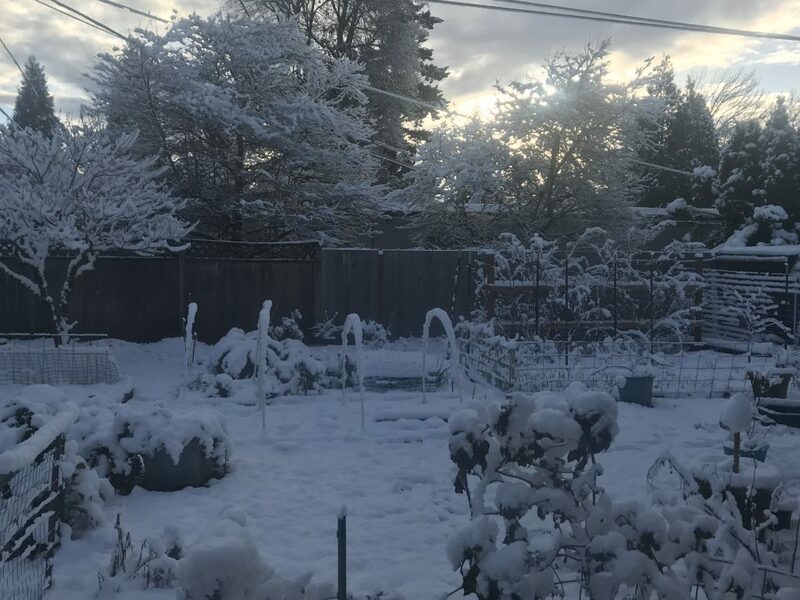 In this pic, the large plants in back are the ones I’ve been calling my “ornamental cauliflower” — they were started from seed in July of 2016. Yes, 2016 and that is not a typo. 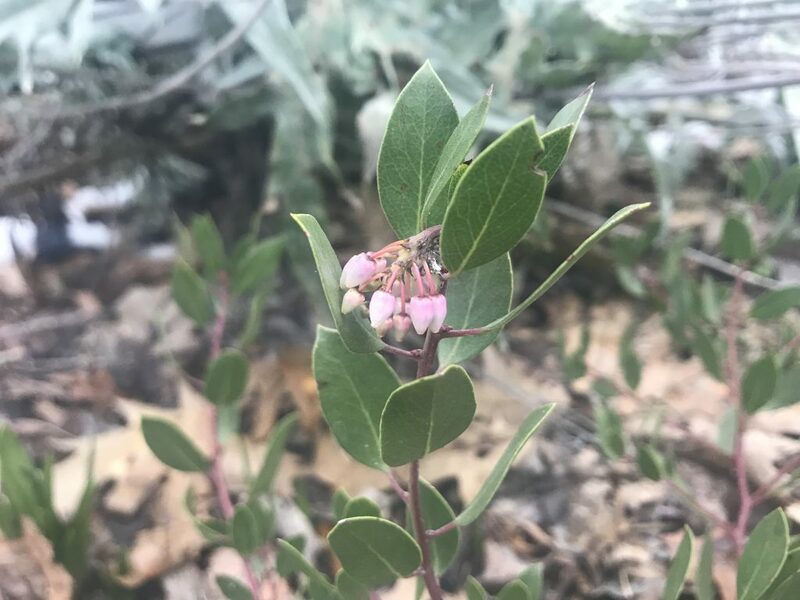 They just didn’t flower – not in the summer, not in the winter, not in the spring… I think it’s just a combination of a lot of factors that prevented whatever triggers their flowering process. 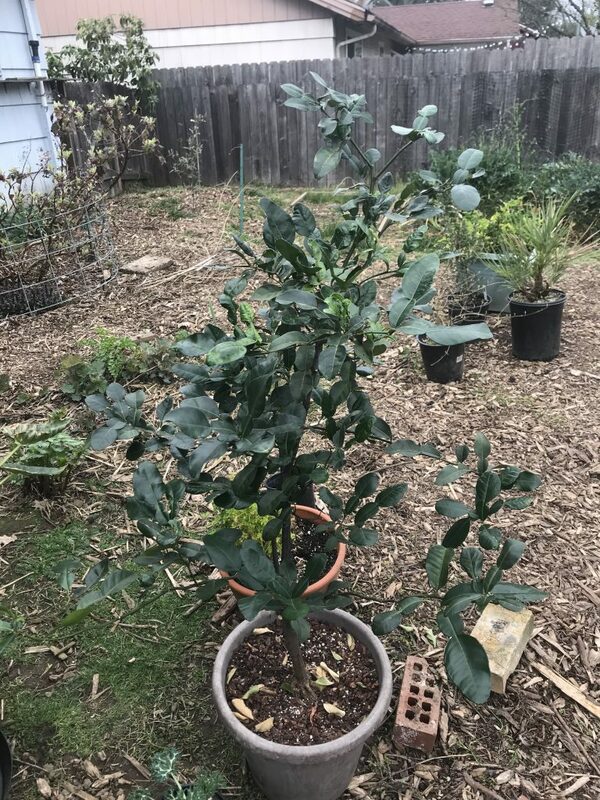 Compare their size to the plants in front, which were started in June 2017. And it turns out, one of them is actually a broccoli! I had no idea. 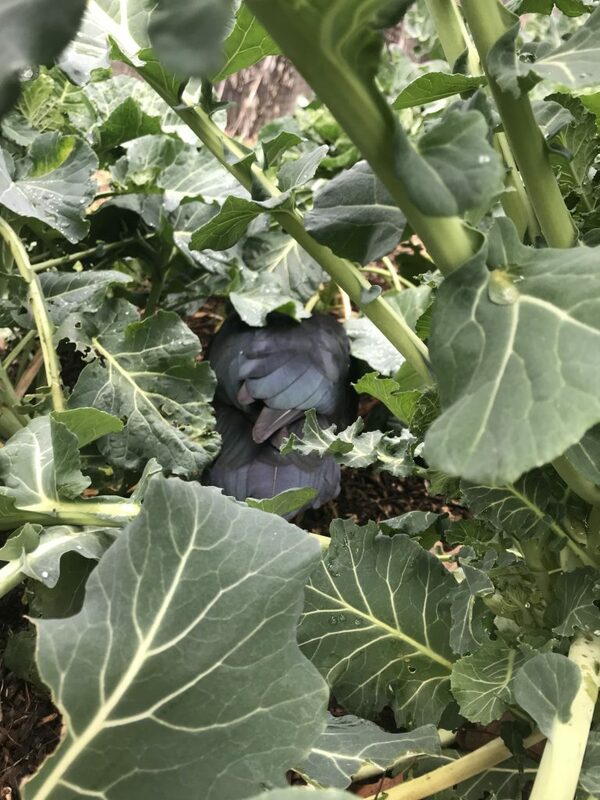 It can’t be purple cauliflower because I didn’t have seed for that in 2016. 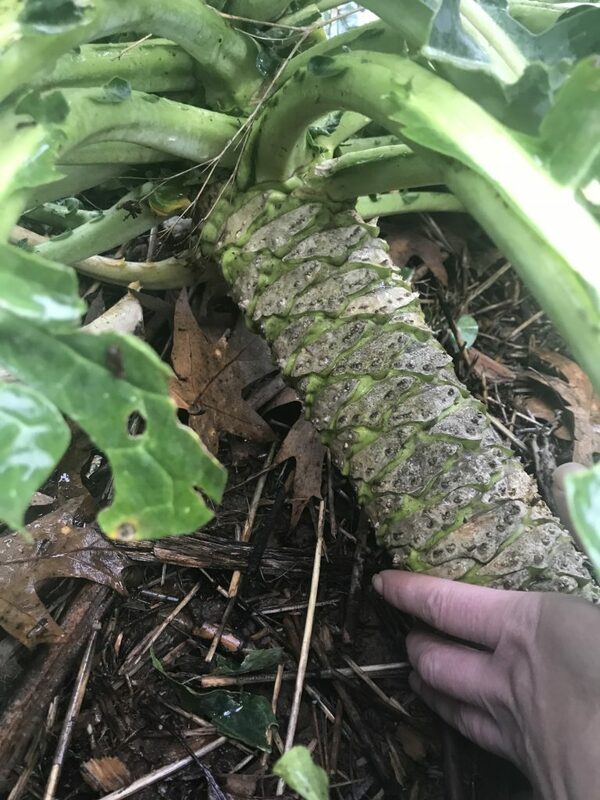 Here are the trunks of the other two plants. If you look closely you can see the plants’ first year of growth mapped out in the leaf scars. From the bottom of the stalks, it goes from summer, then to winter, and then summer again where the scars are more spaced out. 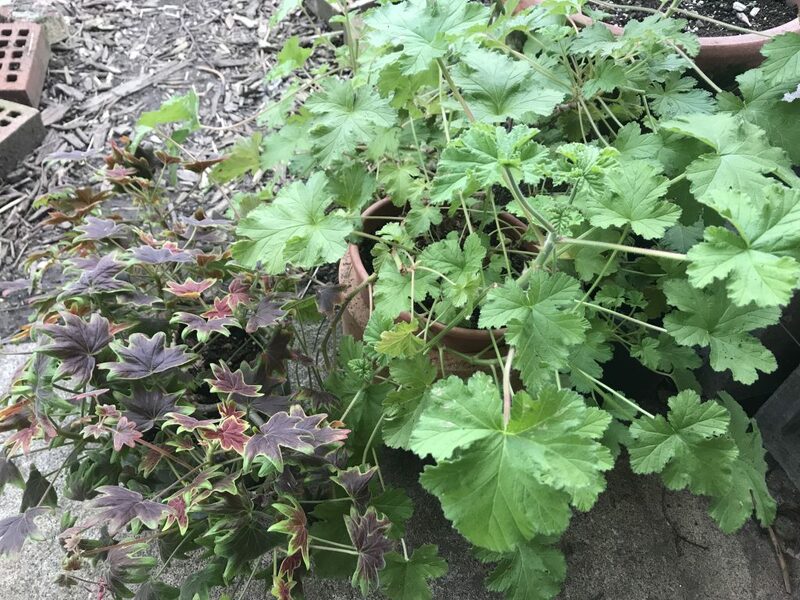 I have really loved these plants and I’ll be sad to harvest them. I might actually try just cutting the flowers and leaving the plants, to see just how long they’ll go. Will they bolt eventually? Will they just keep growing? 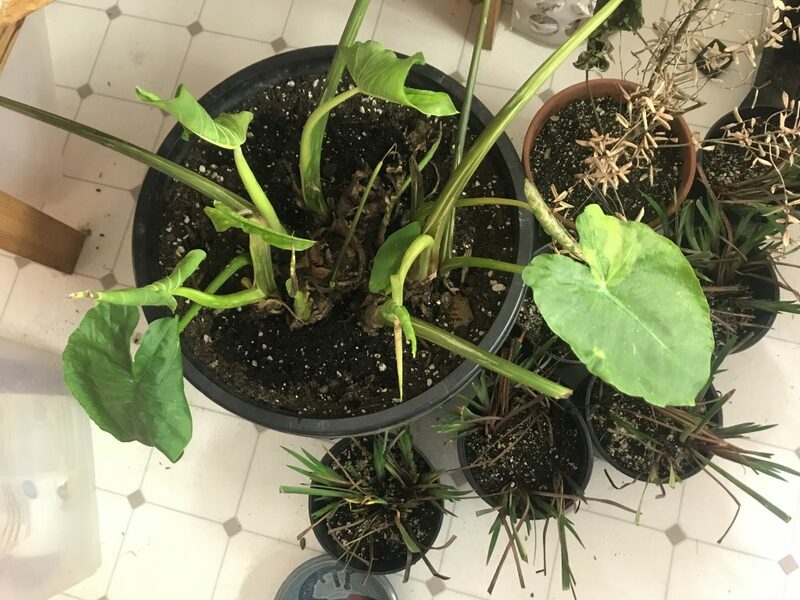 Are they truly perennial or will they someday actually die? I find them quite fascinating and beautiful. Lastly we have nearly 300 garlic cloves planted in this bed. Well, cloves-turning-into-heads. 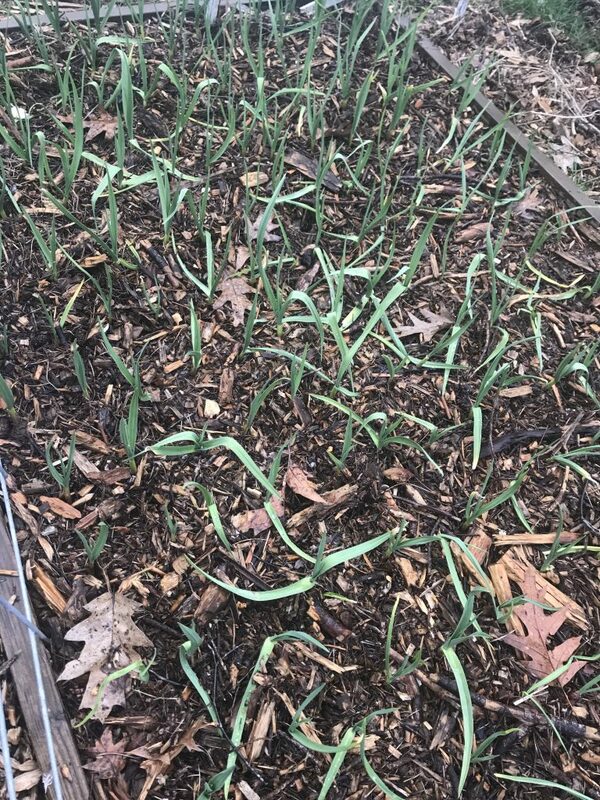 The ducks nibbled our garlic quite a bit last year too, but they haven’t done that this year. I really do think it’s because of the wood chips. A few of them are a little smashed – that’s because Ramona landed directly on them the other day when she flew over. 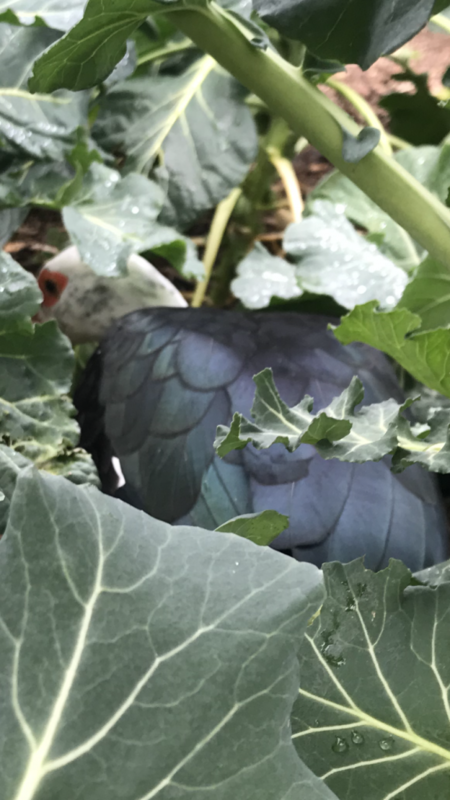 The ducks roost at night in the coop with the chickens, and when I let all of them out in the mornings, the ducks fly over the 5′ fence out of the chicken run and into the garden, where they hang out all day until I let them go back and roost at night. They’re not super accurate fliers, so a smashed garlic plant on occasion is just part of the deal. 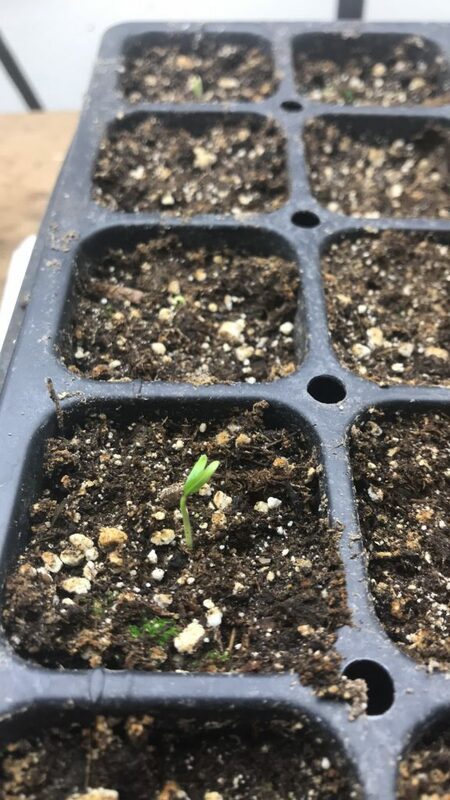 Next week I’ll be starting my tomatoes indoors. This year, I’m trying a completely new-to-me thing with them: grafting! You can bet I’ll document that whole process here. That’s it for the vegetable garden highlights. 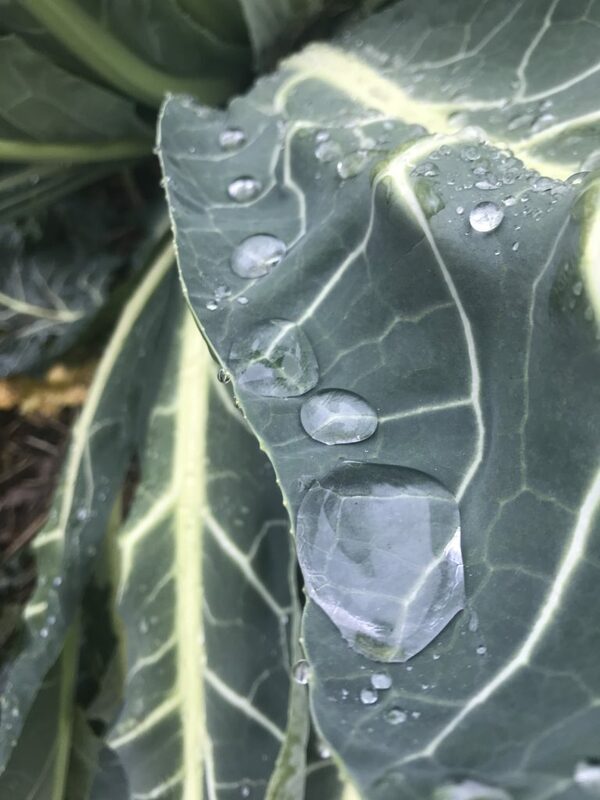 This has been a remarkably mild January, and overall a zone 9 winter, but mild winters aren’t really a requirement for winter gardening in the Northwest; you can still grow brassicas and garlic over the winter in zone 7. That said, here’s hoping February turns out to be as kind as January has been!